Steam Assisted Gravity Drainage (SAGD) is a widely used thermal production technology to extract bitumen from Alberta’s subsurface oil sands deposits. SAGD involves injecting high-temperature steam underground through a horizontal well to melt the bitumen, allowing it to flow to an adjacent horizontal well. It currently accounts for over 50% of oil sands production in Alberta and is the fastest growing production method by a large margin. SAGD facilities have highly integrated hydrocarbon and water treatment units. The water treatment and steam generation sections of the plant handle the largest volumes of fluids in the process. Currently, oil treatment facilities are generally modelled using Aspen HYSYS, while the OLI software is used within several spreadsheets to carry out the detailed electrolyte calculations of the water treatment section. 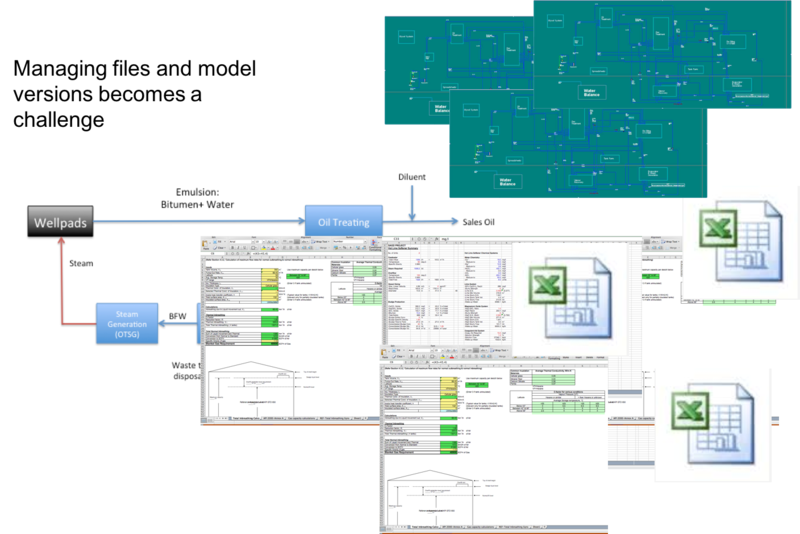 The workflow required to analyze numerous design scenarios result in inefficiencies as it is difficult to manage and maintain models in separate software tools and spreadsheets tend to proliferate quickly. In this project, a novel approach has been developed to fully integrate OLI calculations in Aspen HYSYS via the COM Thermo interfaces. In this approach, water treatment is isolated in a sub-flowsheet inside HYSYS with OLI acting as the calculation engine. The customized tool enables various users to work in a consistent environment with an efficient workflow for SAGD operations. The model of the plant includes all the rigorous calculations provided by OLI and reports mass and energy balances using the HYSYS infrastructure. The HYSYS streams perform flash calculations that consider both phase equilibrium and chemical equilibrium simultaneously. Changes in pressure, temperature or composition upstream in the oil treatment section are reflected in the water treatment section as pH changes and various ionic species come out of solution as a solid phase or dissolve in both the aqueous and the hydrocarbon phases. A number of unit operation extensions were also developed to model the water treatment processes, including Warm Lime Softening, Ion Exchange (WAC) and others.